You are here: Broll Latest News Retail Sector #BlackFriday affecting SA's December retail trade? #BlackFriday affecting SA's December retail trade? South Africa has seen the Black Friday sales phenomenon grow exponentially in recent years, quickly entrenching itself as a major calendar event on the local retail and shopping scene. The Black Friday sales bonanza, which takes place towards the end of November, is now bigger in SA than ever before. It is a boon for retailers, shopping centres and consumers. However, is Black Friday an emerging threat for the traditional December festive season sales boom? That's the question Broll Property Intel - the research division of progressive Pan-African property group Broll - looked into in its latest SA Retail Snapshot (Q4:2018) report. "The new edition of our popular quarterly report points to increasing retail sales in November bolstered by Black Friday, however, December trade is slowing. It begs the question of whether Black Friday will see November retail trade overtake December trade in SA in the future. This has already happened in the United States (US), where Black Friday orginates," says Elaine Wilson, Director of Brol Property Intel. Black Friday is a US retail tradition, which takes place on the day after the Thanksgiving public holiday. It is believed to have started in the 19th century and is known as the unofficial start of the Christmas season in the US. The retail phenomenon has since gone global, reaching SA's shores in 2016. "Black Friday has grown over the years, converting your average shopper into a bulk-buying bargain-hunting insomniac, but today's consumers are just as likely to shop online as they are to visit brick-and-mortar stores. Black Friday has also resulted in the emergence of the Cyber Monday sale, which punts online tech and electronics on the Monday after Black Friday," says Wilson. According to Black-Friday.Global, interest in Black Friday deals in SA has grown exponentially by around 9,900% since being introduced and by 117% globally over the past 5 years. The SA Retail Snapshot report (Q4:2018) looks at Black Friday trends in SA. It also highlights shifts in US retail trade possibly due to Black Friday and questions if this will also emerge as a trend in SA. The report cites figures from the US Census Bureau, which show retail trade in December 2016 increased by 3.7% year-on-year while November increased by 3.3%. Since then, the year-on-year growth in November sales has surpassed that of December. In 2017, a year-on-year increase of 6.0% in sales was recorded in November while December figures increased by 5.7%. In 2018 year-on-year sales figures increased by 4.1% in November and 2.3% in December. "Over a five-year period (2014-2018), November sales in the US have increased by 16.1%, while December sales have increased by 15.3%. Black Friday and Cyber Monday are thought to be the main contributing factors that have resulted in this paradigm shift," the SA Retail Snapshot notes. "Unlike the US, Black Friday is a relatively new concept in SA with its formal debut in the retail market in 2016, of which only a few retailers participated while others observed. Since then, in 2017 and even more so in 2018, an increased number of retailers have participated and benefitted from this retail trend, while there were still a small number of cautious bystanders," the report adds. SA's November retail sales have been increasing on the back of Black Friday. However, will November retail sales ever surpass SA's main festive season splurge month of December? Citing Stats SA figures, Broll Property Intel's report notes that November retail trade sales (constant 2015 prices) overall increased by 18.2% over a five-year period (2014 - 2018), while trade in December for the corresponding period only increased by 8.7%. November 2018 retail sales amounted to R87.630 billion, an increase of 2.9% year-on-year. While December 2018 retail sales decreased by 1.4% year-on-year, retail sales for the month amounted to R104.336bn. This highlights the fact that December is still SA's biggest retail sales month (almost R17bn more than November in 2018). Having examined Stats SA data and the change in retail trade for November and December, Broll Property Intel also investigated retail trade trends within the Broll Managed Portfolio. This was done in order to gain better insight into which centre types and retail categories benefitted most from Black Friday and Cyber Monday in 2018. Broll manages in excess of 4 million square metres of retail space in the SA market. "December trade remains higher than November, emphasising that festive season trade is still the traditional shopping season in the South African retail market. Data provided by Stats SA does however indicate that December trade has started to experience a decline in growth," notes Broll's SA Retail Snapshot report. "Could this decline be due to Black Friday or purely the result of consumers finding themselves under increased financial pressure, forcing cautionary spend over the festive season? Or, is it a combination of both? With a wide range of factors at play, it is difficult to pin point the main contributing factor to lower sales figures," it adds. Wilson comments: "What is certain is the fact that Black Friday and Cyber Monday are growing in popularity within SA and are becoming entrenched in the local retail market. Additionally, if one looks globally, Black Friday and Cyber Monday are not the only shopping trends making waves in the retail market." She points to China and what online retail giant Alibaba has done with its "Single's Day" campaign. On 11th November 2018, Alibaba's annual Single's Day (now rebranded as Double 11) generated more than $30.8bn in online sales within 24 hours. In 2017, Black Friday and Cyber Monday sales combined in the US totalled US$10.6bn, compared to US$25.3bn in sales for Single's Day in China! Wilson concludes: "Trends to watch in 2019 include the growth of online sales in SA around Black Friday and whether new campaigns such as Single's Day will hit our shores... This year Black Friday will take place on November 29th. It is important to note that, unlike last year, Black Friday in 2019 takes place after the 25th, which is traditionally pay day in SA. This could result in higher sales, but only time will tell." 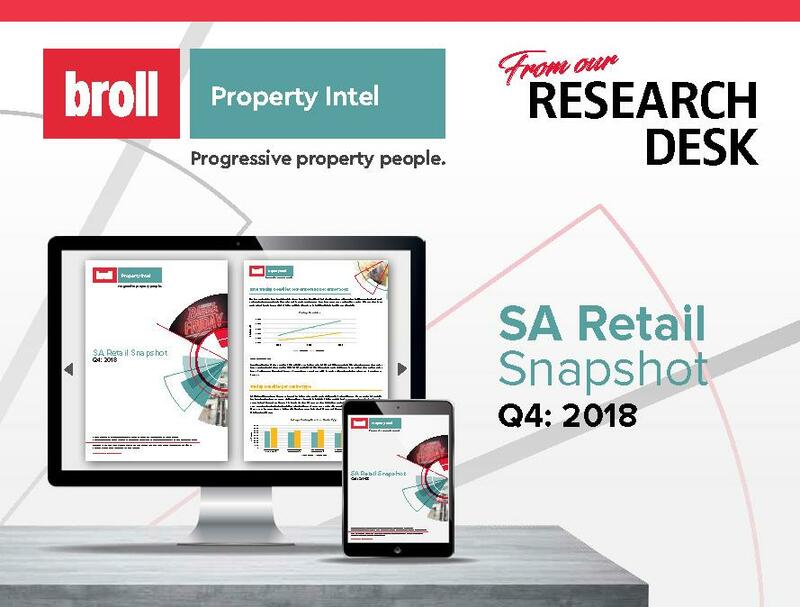 Click here to download Broll Property Intel's latest SA Retail Snapshot (Q4:2018) report.